If you are signed in to Google Chrome or using a Chromebook/Chromebase – you are already signed in! If not, go to gmail.com, you will sign in with your full district email address (either @wwcsd.net for staff or @wwcsd.org for students) and then enter your district password. An overview of Gmail. 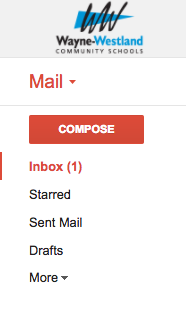 Left Menu: Compose, Inbox, Sent, Starred and Spam Mail. Upper Center: Select/deselect all, Refresh mailbox, More Options, Search here. Center: Email messages. Upper Right: Your profile icon, Settings. “Mail” button – toggles between your mailbox and your contacts. Spam – It is recommended to check this folder for unrecognized messages (such as mass emails or outside senders). If you think you are missing a message – check here. “Folders”/labels will appear here after you create them. You can “drag” folders (such as your Spam folder) above the “Less” line to have it readily available (without having to click “More” each time to view it). Google Hangouts: These are Google Hangout menu options. Initially the “Messages” option is selected to show any Google Hangout messages – you can click the center icon to close this tab and see more of your Left Main Menu. Checkbox: Allows you to select specific email in your inbox. It defaults to either “All” or “None” depending on what is selected. (You can click the down arrow to get the options seen here. Settings Icon: This gives you options to change how you view your email (Display Density) and how to change how you view your email. Themes: Changes the visual appearance of your email box. Configure Inbox: It is suggested to uncheck all of the checkboxes and click “save.” If checked you may get email diverted from your inbox to other folders. Click “Compose” (red button in the upper left menu). A small window will appear for you to type your email at the bottom of the screen. Select “Labels” (Tag Icon): Select one or more labels for your message, then choose “Apply”. If you need to create a new label, start typing the label in the text box. Click “Create” to make a new label (you can also search for labels this way.) The label will appear on the message. Select “More” in the left toolbar and choose the option “Create a label”. Either way a label is made; it will appear (similar to a folder) in the Left Menu. Clicking on the Label will show all the messages with that particular label. Move: This is the “folder” icon. 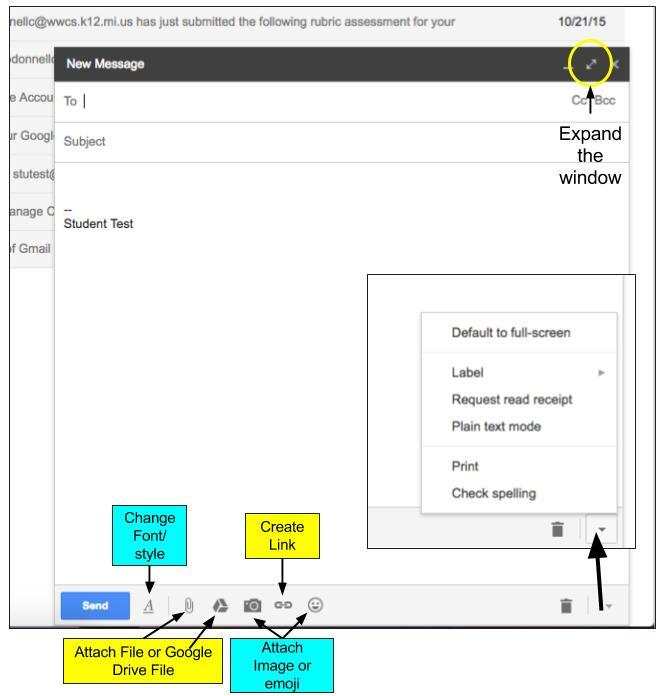 It will move (and label) an email out of the inbox to another label (folder). More: This is where you can mark something as unread, as unimportant, or create an event in Google Calendar, etc – there are many options here to explore to personalize your email. Finding a specific person’s email: In the search bar type their name or email address, then press enter. (If a dropdown appears with who you are looking for you can also click that.) All of the correspondence with that person will appear; you may see labels on the message telling you where the message was found or labeled. Finding a specific email about a topic: You can now start typing a keyword (such as “Leadership Day” or “NWEA” in the search bar. All of the emails will appear with that keyword available to choose from. Just like Google Chrome, Gmail can be customized to the user’s preferences. Most of these changes can be done in the Settings section (the gear in the upper right) and choosing Settings. As a note: Unlike much of Google, you must save your options when making changes to have them take effect. (The save button is at the bottom of the settings page.) You may need to refresh your screen (not just the mailbox) to see these changes. Default text style: Choose text size, Color, and font. This will be the default for when you write email. Conversation Mode: Conversation mode “nestles” or groups messages of the same name together in one email “chain”. If this is turned off it will send each reply as a separate email to your inbox. If grouped together, each time there is an additional reply to the conversation it will appear as an unread message in your inbox. 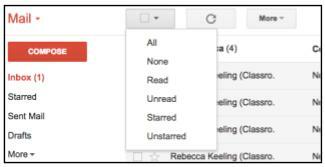 Undo Send: Gmail gives you a maximum of 30 seconds to “undo” a sent email. Stars: You can prioritize your email visually by giving different stars. By default you have just the standard Gold star; you can choose to add any of the other options by dragging them up to the next row. To “star” a message, either click the star next to the message in your inbox or choose “star message” under more options when reading the email. All starred messages will appear in both your inbox/label and in the “starred” label. My photo: Change your photo that will appear when you email someone. Most of the choices listed under General are basic email changes. There are other personalization options that can be used including Labs and Themes. 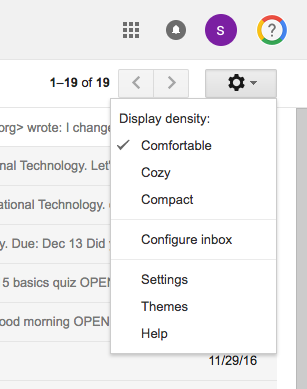 You can change the visual theme of your Gmail (instead of the white default view). The good news is that if you don’t like it, you can always change it back. Labs are experimental but can assist you with personalizing your experience with Gmail. You can enable a Lab by choosing enable (by default they are disabled) and then clicking “Save changes” at either the top or bottom of the list. This will cause Gmail to refresh and your lab to be enabled. Auto-advance – it allows the user to go on to the next message when deleting or moving a message. Google Calendar – Your calendar will show in the left side menu instead of your Google Hangouts. You can disable the calendar view by either clicking on the lower left menu and choosing to hide the calendar or by simply disabling the lab. Unread message icon – if your inbox is open you will be able to see how many unread messages you have.